One assumes that because Robert Carlyle is returning back to the realms of Scotland for his directorial debut, he’s making a spin-off of his terrifying Begbie character from Danny Boyle’s Trainspotting. Alas, The Legend of Barney Thomson is a much tamer affair – but given its subject matter, that’s not really saying much. Carlyle directs himself as Barney Thomson, an unhinged Glaswegian barber stuck in a monotonous lifestyle, and caring for his elderly mother (Emma Thompson) who herself is a bit of a loose cannon with her constant bingo nights and monstrous personality. Everything changes for Barney, however, when he accidentally stabs his boss in the chest and takes it upon himself to dispose of his corpse, with his mother’s alarmingly willing help – but as the bodies start piling up, he catches the attention of English policeman Holdall (Ray Winstone) who is on the hunt for Glasgow’s elusive serial killer. Based on Douglas Lindsay’s book The Long Midnight of Barney Thomson, the first in a series of novels about the titular character, Carlyle’s adaptation – written by Richard Cowan and Colin McLaren – goes more for pitch black comedy, similar to that of Trainspotting and Filth author Irvine Welsh; however, what Barney Thomson doesn’t manage to get down that those respective Welsh adaptations did was the balance of the satire with the grotesque. In Filth, for instance, the concept of police incompetency was complimented by the fact that James McAvoy’s Bruce Robertson was a delusional and sociopathic monster; both work together to create an unflinching experience that told a dark farce that was as compelling as it was unpleasant. The problem with Barney Thomson, however, is that it’s too straight-laced; though Carlyle is certainly a competent director in other areas, he can’t seem to find the compromise to blend the two together which results in the film being way too much of one or the other. If it’s over-the-top goofy, then it’s just that and nothing else, and vice versa with some of the darker moments; the closest it gets to pulling off both simultaneously is the film’s violent climax which, despite stretching credibility just a little bit, teases what could have been if the two themes had been properly married. Until then, it really struggles on that front. Thomson himself is also a difficult character to get behind, despite Carlyle’s desperation to make his character sympathetic. Like Begbie, we first see him being prone to sweary outbursts towards customers as a sign of his depression and being generally incompetent in his job, such as falling asleep in the middle of a busy barber’s shop, but for some reason when he makes the first kill he suddenly switches to a mild-mannered and horrified assailant with a guilty conscience. Both elements of the character, much like the overall tone, don’t seem to go hand in hand, and it only distracts the viewer who is more focused on this sudden switch of personality than anything else. His nervous disposition, especially when interrogated by Winstone’s Scot-hating copper, tends to become a little irritating after a while, and by the end you’re secretly hoping that he gets taken down by the authorities. Thankfully, though, it’s another Thompson that comes to the rescue. Despite only being two years Carlyle’s senior, Emma Thompson is clearly having an absolute ball as Thomson’s 79-year-old mother (made possible by a bit of heavy make-up). Playing an outright monster of a mother, with her leopard jacket and red wig with all the loud-mouthed sophistication of a typical character on EastEnders, she is saddled with the film’s funniest and most outlandish moments, whether they be offering a Tic-Tac in the presence of a corpse or swearing viciously at a greyhound race while downing a pack of chips. Her Scottish accent is more than spot-on, having previously given us a glimpse of that in her vocal performance in Pixar’s Brave, and she by far makes the film more tolerable with her endlessly watchable comedic performance. We wouldn’t necessarily say that The Legend of Barney Thomson is an outright failure of a movie, with Thompson’s wildly entertaining role bringing the film further to the surface, but it just can’t compete alongside the likes of Trainspotting or Filth when depicting a darkly comic version of Scottish lifestyle. Douglas Lindsay, and by extension Robert Carlyle, is simply no Irvine Welsh. 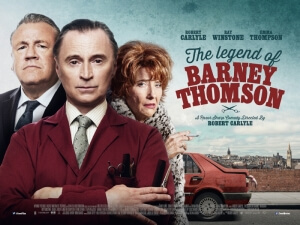 The Legend of Barney Thomson doesn’t manage to find the balance between the satire and the grotesque as well as the likes of Trainspotting or Filth did, but Robert Carlyle is a fine director and Emma Thompson is a riot.